The Foch is heavily dependent on being able to snipe from medium to long distances or flanking unsuspecting enemies. It is an extremely difficult tank to play at close ranges due to its length, middling traverse speed, and prominent weakspots that negate its otherwise excellent armor: the ever-present rangefinder and turret on top of the French tank destroyers. These must be exposed whenever the Foch has to open fire at an enemy, and the only real thing a player can do to counter this is to wiggle the tank and hope for a lucky miss or ricochet. For similar reasons, fighting on hilly terrain is highly not recommended in the Foch unless there is no other option. The low HP pool does not help in this respect either. The absolutely horrible armor on the sides, rear, and top make it very vulnerable to flanking attacks and artillery hits are devastating to the Foch. The firepower of the Foch is by far its greatest weakness, the 120 mm SA 46 being the only gun option. 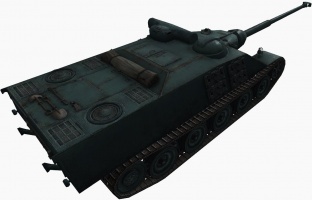 While a very powerful gun at Tier 8 on the AC 48, the gun is very weak for a tank destroyer at Tier 9. It has by far the lowest damage per shell of any Tier 9 tank destroyer gun, tied only with the Tortoise. However, while the Tortoise has a phenomenal rate-of-fire to compensate for this (among the best damage-per-minute values of any tank in the game), the Foch has no such consolation. 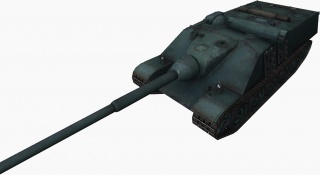 With barely over half the shell damage of the T30 or Object 704, the Foch must expose itself to repeatedly shoot an enemy. The disappointing damage output means it needs to land at least two shots from a clip to justify the trade, when opponents can fire and (should) retreat to avoid those follow-ups. The terrible gun dispersion values make it absolutely hopeless at snapshotting enemies, although the aim time is significantly better than on the AC 48. The penetration is acceptable enough under most circumstances, but can be frustrating when combined with the Foch's horrible dispersion values. That said, the Foch does boast good speed and acceleration, which does allow it to reach aggressive forward positions or keep up with medium tanks, if one prefers to live dangerously. However, it has only slightly better hull traverse than the Object 704, and if a fast medium or light tank gets on the side or behind a Foch, it is game over. It absolutely requires support to cover its flanks if played aggressively. When allowed to play as a medium/long range sniper, the Foch can also perform decently, as it becomes much harder to hit the weakspots and the armor becomes more effective. The gun is also quite accurate once fully aimed, and it can hit fairly reliably at long distances. It also has decent camouflage values and view range, making it harder to spot. In this respect, it plays similarly to the SU-122-54, which has a far greater damage output and agility, while the Foch has much better frontal armor and a more accurate gun at long ranges. 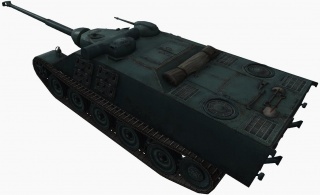 Overall, the Foch is a difficult tank destroyer to play aggressively, and can be a frustrating experience, especially to a less experienced player. But, then again, if you have made it this far up the French tank destroyer tree, you should not be surprised by this, right? Stock suspension can handle a lot of weight, therefore engine > track. After the war the French Army possessed no modern tanks with a heavy armament. The ARL 44 was being developed, but this vehicle, though to be armed with a powerful 90 mm gun, could hardly be called modern, as its suspension system was obsolete. 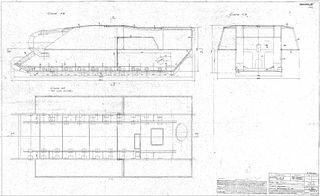 Therefore already in March 1945 the French industry had been invited to design a more satisfactory vehicle. 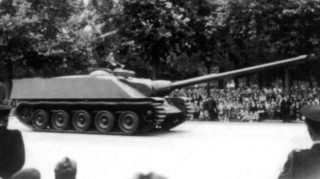 The same year the AMX company (Atelier de Construction d'Issy-les-Moulineaux) presented its projet 141, a project to build the so-called M 4 prototype, armed with a 90 mm Schneider gun. The M 4 closely resembled the German King Tiger in general form, though the turret was to be made of welded sections; but to limit the weight to a desired thirty metric tonnes the proportions were rather smaller and the armor had a maximum of just thirty millimeters. Like the later German tanks of the war it had, in this case eight, overlapping road wheels. Part of the project was to study whether a modern torsion bar suspension should be used or the height lowered by ten centimeters through a fitting of leaf or coil springs. Two prototypes of the M 4 were ordered. The Army soon indicated that a protection level of thirty millimeters was unacceptably low. In response armor was increased. To save weight it was decided to install a novel oscillating turret, designed by FAMH. 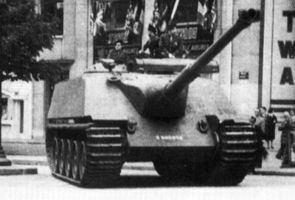 Nevertheless, when the first prototype, now named the AMX 50 after its intended weight class, was delivered in 1949, it weighed 53.7 metric tonnes. In the winter of 1950 instead of the 90 mm, a 100 mm gun was fitted, designed by the Arsenal de Tarbes. The second prototype with a slightly different turret, but also with a 100 mm gun, was ready soon after. The prototypes had a length, with gun, of 10.43, a width of 3.40 and a height of 3.41 meters. 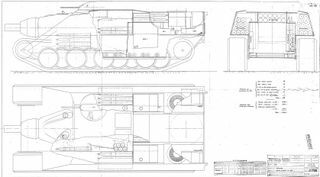 It was intended to fit a 1200 hp engine to attain a speed much superior to all existing medium tank types. The Maybach HL 295 (a redesigned German gas engine in 1945 captured at Friedrichshafen by Engineer-General Joseph Molinié) and a Saurer diesel engine were tested. Both failed to deliver the required output and maximum speed was in fact no higher than 51 km/h. The prototypes were tested between 1950 and 1952. 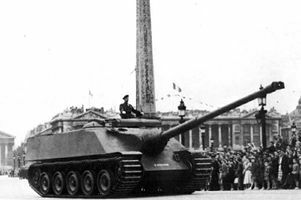 Based on the M 4 chassis in 1950, AMX presented a prototype of a heavy tank destroyer in the form of a 120 mm self-propelled gun, the Canon Automoteur AMX 50 Foch, named after Marshal Ferdinand Foch. It was intended to give long range fire support to the medium/heavy AMX 50 100 mm model. The design had a lot of similarities with German Jagdpanther tank destroyer. It had a long bareled 120 mm gun with a muzzle break attached to a well sloped and heavily armored flat profile vehicle. Remotely controlled anti-aircraft machinegun was placed on the right side of the roof, while commander’s cupola with the range finder was pushed to the left. Unlike previous post war concepts like the Mle. 1948, several AMX 50 TDs were built, the first in 1950. Field tests were promising, and army started to prepare to adopt AMX 50 Foch in small numbers. When AMX engineers managed to install a 120 mm gun into an oscillating turret of the AMX 50 120 tank, Foch immediately become obsolete and all further development and production were stopped. This page was last modified on 18 January 2019, at 03:16. This page has been accessed 266,718 times.